Next week's Sporting News sure looks interesting as indicated by this front cover image sent to us with a note speculating its roots: "Perhaps it has something to do with Sporting News general manager Jim Borth formerly being the head of circulation at Dennis Publishing." Perhaps, indeed. Highjacking the Numa Numa video and its various incarnations, New Zealand's 42 Below Vodka has set up a special call center in India to cope with apparent Holiday demand for its vodka and is promoting it with yet another version of Gary Brolsma's Numa Numa. Because we're only "almost sorta hip" and not entirely hip like the rest of you, this Numa Numa thing amuses us every time. In fact, one day...at band camp... (see how unhip we are using five year old cultural references?)... we spent an entire hour on GaryBrolsma.Net watching the endless collection of knock offs. Now 42 Below can add itself the the list. To illustrate just how much better its all you can eat package is as compared to iTune's and other's 30 second song preview approach to selling online music, Napster shows just how frustrating that 30th second can be. There's really not anything else to say about this other than point made, point taken...perfectly. 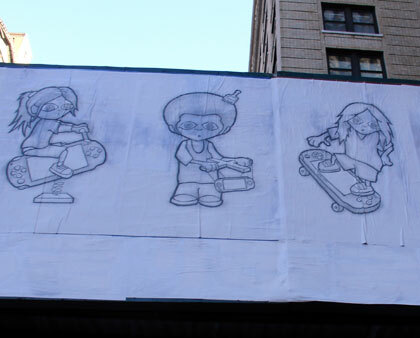 Street art site Wooster Collective spotted some chalk drawings in New York, and received similar images from a reader in Philadelphia, that are ads for Sony's PSP. The images contain no words, no logos and no product references. It's just a bunch of kids playing with the PSP as if it were a skateboard, puppet, paddle or ice cream bar. The images are intriguing enough to cause attention, at least in our opinion, causing the viewer to realize the thing in the ad is, in fact, a PSP. Good stuff. 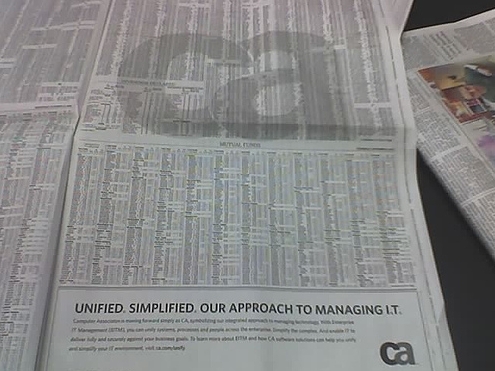 Computer Associates is sponsoring the stock pages of The New York Times with a watermark ad. These ad placements are on the rise as yet another method of getting ads seen by readers. Perhaps we should label these watermark ad "news-pops." After all, just like the dreaded online pop up, these ads appear over edit without user consent. OK, so watermark ads are nowhere near the annoyance level of horrific pop ups but there is a bit of similarity here. Not that it will necessarily curtail or make it any easier to find scumware peddlers but the Senate Commerce Committee is doing its best with its introduction of the SPY BLOCK act. The act, called the Software Principles Yielding Better Levels of Consumer Knowledge Act, was introduced yesterday to the Committee by Montana Republican Senator Conrad Burns and aims to make illegal the less than honest practices of adware and spyware companies. Practices such as endlessly looping pop ups, identity theft, changing browser settings, fake uninstalls and unclear installation information. Hopefully, this bill will less toothless than the recently signed California Spyware bill. Now here's a Hyundai commercial that's just funny enough it doesn't matter whether or not you can understand what language it's in. The idea is clear: reclining seats are a very important feature and one that can save a marriage. Painfully, it's in Real Video. Thanks, Rick.